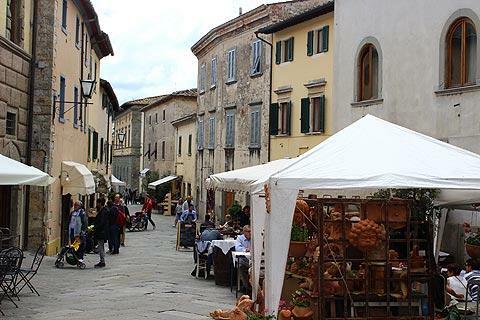 The small town of Castellina in Chianti is one of the most important towns in the Chianti region beetween Siena and Florence, and is also very pleasant to explore with a great deal of charm and some interesting monuments. Castellina in Chianti is actually on the SR222, the so-called Strada Chiantigiana which is the main tourist route through the Chianti region, so very easy to visit when you are exploring this lovely region. There is a large car park on the northern edge of the village, from where you can quickly reach the historic centre and also have some nice views of the village along the ridge of the hill as you approach. 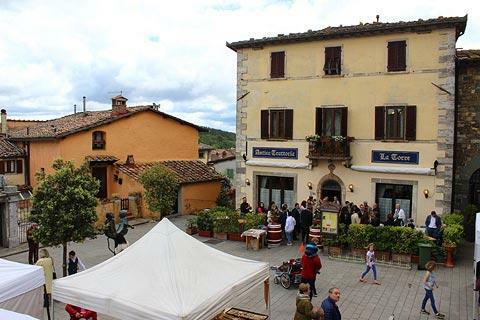 Within the village centre there is one long main street where you will find numerous small shops and cafes, and just to one side of this street is the central piazza. Throughout the centre you can see interesting townhouses and palazzos. 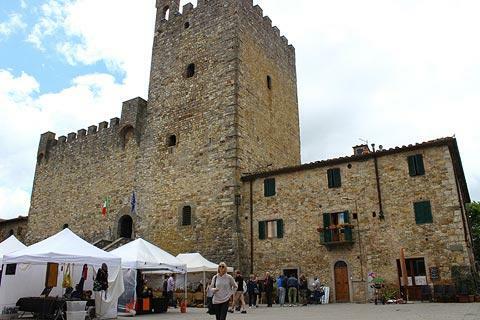 Part of the centre is also surrounded by a fascinating vaulted alley called Via della Volte, once part of the city walls and now a centre for small shops and restaurants as well as having views across the surrounding landscape and certainly the most unusual feature in Castellina in Chianti. Italy This Way comment: we were lucky that when we visited it was the day of the village fete so there was a great deal of activity as well as lots of stalls selling handmade items, artworks and snacks as well as a procession of original Fiat 500's and Vespa motor bikes: great fun, but I can't promise it will be quite so lively when you visit! 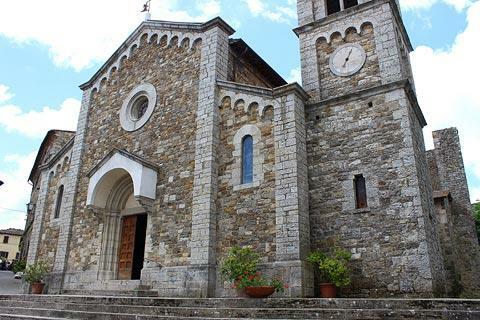 On the main street you will also pass the Church of San Salvatore. You will notice that the church actually looks quite new: this is because it was very damaged in the Second World War and needed to be rebuilt. Inside the church you can see a 15th century fresco of the Virgin and Child by Lorenzo Bicci. 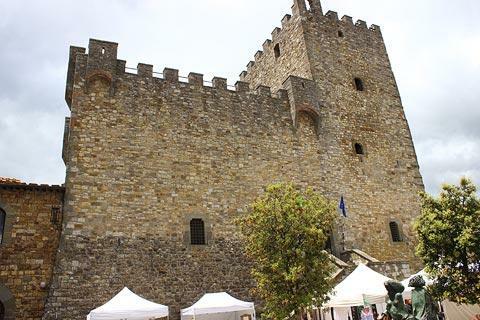 In the central piazza in Castellina you can see an imposing 14th century fortress and its tower. Part of the castle is now used for local government and part for the Archaeology Museum of Chianti Senese. The museum was originally founded because of the important artefacts discoved at the nearby Etruscan site of Monte Calvario and now includes items from the region from the Bronze Age, Etruscan and Hellenistic periods (that is from about 1000 BC to 100 BC). The Etruscan site of Monte Calvario can be visited just outside the town. 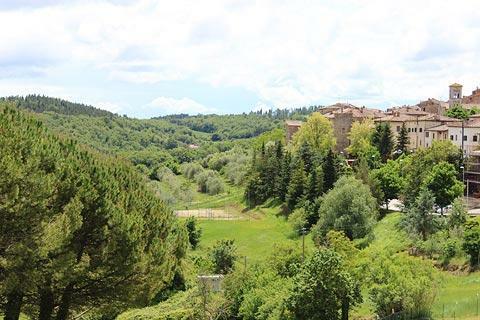 There are several interesting towns and villages in the Chianti region around Castellina in Chianti, as well as some of the most lovely scenery in Italy. See the Chianti guide for details.